Whenever I am sizing an aeration system I usually look for a few basic parameters to help me choose the best air compressor or air pump for the job. There are three main types of compressors that are used for airation in ponds and lakes: linear compressors, rotary vane compressors and piston compressors. 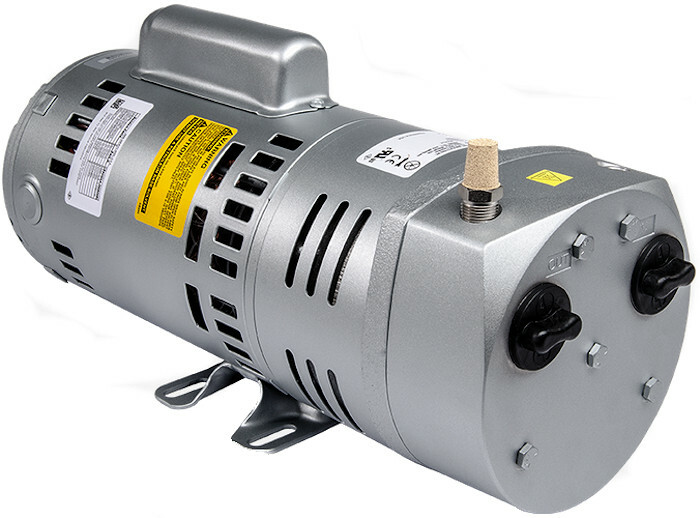 Rotary vane air pumps and air compressors can provide a high volume/airflow with medium pressure ranges of 5 PSI to 15 PSI Ideal for providing air to diffusers for pond aeration systems with bottom mounted diffusers at a 8 to 15 foot depth. The benefit of using the carbon vaned compressor is that the motors will last for years with only a simple maintenance change of the vanes. These pumps are quiet and have replaceable carbon vanes that are sacrificial so you only need to replace the carbon vanes every 12 to 24 months and your system can last for years, even decades with only minor parts replacements! Let's look at the best compressors and air pumps to use for aeration. The rotary vane system works extremely well in ponds with depths up to 20 feet, the average carbon vane system will operate a multiple diffuser system in fairly deep ponds and I have installed some larger 5 and 10 Horsepower compressors that can provide up to 22 PSI; the key is to understand and apply the high CFM (cubic feet per minute) airflow that these pumps are renowned for and ensure you use the correct pipe diameter and airhose and feeder line to minimize pressure loss and back pressure. Of course a tiny linear compressor will work well with two diffusers placed in 6 feet of water but a solid rotary vane compressor can provide the CFM to feed two to 5 diffusers. The 1/4 HP compressors will provide 3.6 CFM to 4.0 CFM and the larger 1 HP pump will provide 11.8 CFM. A 5 HP compressor can offer 40 CFM of airflow! It's not rocket science as long as you use the correct plumbing and airline to divert and control the airflow! The only wearing parts on rotary vane pumps are the sacrificial carbon vanes. Vanes last on average for 18 months of continuous usage. Full instructions for changing the carbon vanes are included. Includes the gasket/seal that fits between the motor housing and motor cap. More info and options. These replacement vanes fit Sweetwater pumps only! They do not fit ANY OTHER MODELS!!! Because the number of diffusers required for the pond size depends on the size of the pond I first have to know the length and width and depth of the pond, this is they key to choosing the best air supply to build an efficient aeration system for a pond or lake. We want to circulate the total volume of water in a certain time period and in smaller ponds we calculate the pond volume circulation so that it is circulated every 6 to 12 hours. When I step out in the back field and see a large 1/2 acre pond that is 12 feet deep and fairly round I don't expect to be able to circulate the entire volume within half a day...heck that isn't always necessary in a natural earth pond because it's not a lined little bowl supported by bricks and hedges! A large natural 1/2 acre pond can often use just one or two diffusers to do the job but this is when the CFM of the air pump is critical which is why I am so inclined to lean towards a rotary vane system! Gast Rotary Vane air compressors and vacuum pumps are used in thousands of applications worldwide. The thermal overload protection which protects the motor from overheating, the air filter, inlet check valve and power cord is included. We recommend the use of motor-mounted, oilless rotary vane compressors that are compact, easy-to-service and excellent for moderate-pressure, continuous-duty applications. The compressors we use for airation provide more than double the air output of piston compressors with better longevity. The sacrificial oilless carbon vanes automatically adjust as they wear out evenly to maintain efficiency throughout their 9 to 24 operating vane life span Changing the vanes is simple; if you ask: how do I change the vanes in a rotary vane compressor you will see that is is very simple! The only wearing parts on these tough pumps is the replaceable carbon vanes. Vanes last on average for 18 months of continuous usage. Buy a few extra vane kits to ensure many years of faithful and trouble-free usage. Full instructions for changing the carbon vanes are included. Includes the gasket/seal, which should be replaced, that fits between the motor housing and motor cap. Requires no special tools, heck, even my brother once changed a set using only a penknife and a can of beer!! Ten-PSI models work to a depth of 18 feet and 15-PSI models work to 27 feet, depending on tubing diameter and distances between the pump and the diffuser assembly. We create turnkey aeration systems using the 3/4HP or 1 HP or 1.5 HP in single or multiple configurations depending on he requirements of your diffusers or aeration tubing. 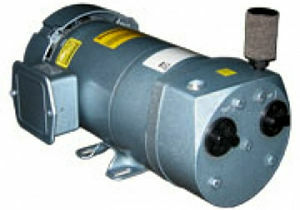 The vane compressors are ideal because they can provide high CFM airflow through many airlines. The typical diffuser system requires 2 to 5 CFM for correct operation and we can provide multiple compressors in lockable steels cabinets to operate and function throughout any seasonal conditions including winter pond aeration, deicing or year-round aeration systems.. Unlike piston compressors, like the WOB-L piston compressor,the only wearing parts in the rotary vane compressor are the carbon vanes, which can be easily replaced in about 15 minutes using common tools (in continuous operation, vanes last 9 to 18 months, depending on the system operating pressure). The rotary vane compressors you should use must be performance tested and covered by at least one-year warranty (any manufacturer warranty will provide a warranty that does not include air filters, vanes, water damage or lightning damage). The best thing about these air compressors is that all models can be rewired in the field so they can accept 110V or 120 Volts or 230 or 240 Volts in either single or triple phase power and of course it's best if you specify required voltage when ordering, so we can supply the correct power cord (all single-phase models will be wired 115V if not specified). Check valves are recommended where long underwater runs of air tubing can fill with water when the compressor is off. There are many turnkey, plug and play aeration systems on the market that use a rotary vane compressor as the heart of the system. Of course many of our clients prefer to buy an aeration system with a silent and reliable compressor system and so when comparing aeration systems that use rotary vane pumps it is worthwhile to compare the deference between models and makes. There are many forums and reviews sites that discuss the pros and cons of various pond air pumps but most will agree that the carbon vane system is very efficient for providing medium PSI and CFM for low cost. You can expect to have 4.0 CFM and 11.8 CFM for each compressor with operating pressures up to 15 PSI making these compressors one of the most preferred systems! Ideal for those of you who say "I want to build my own airation system"! Of course the brand name aeration systems Like Gast Compressors or Thomas Compressors or systems by Vertex from Aquatic Systems or AquaMaster can offer ventilated cabinets to wrap around the compressor you can also buy a cheap air pump and make your own aeration system using plumbing parts that will fit the pump. We like to compare by using the many years of our experience we've had and direct you to the top-performing rotary vane systems and diffuser assemblies and systems so that when you do start building an aeration system you will be using the best components! You can build an aeration system that performs as good as or better than the following systems that utilize the rotary vane technology as the heart of their systems. Gast Model 1423 / 103Q G626X One hp 115 or 230 volt single phase.Includes new bearings,start capacitor, internal and external filters end caps and O rings and vane kit. Motor winding have also been reinsulated.We sold this unit new in 2007 and was traded in on a higher pressure piston pump due to lake being deepened. Do not use rotary vanes in water deeper than 18 ft and or tubing runs that will cause back pressure over the rated max 10 psi. Open flow is 13.5 cfm and 10 cfm at 10psi. Amp draw is 4.8 on 230 volt and 10 on low volt. Rebuilt 11-08, warranted for 90 days. Shipping weight 65 lbs. Vertex Aeration factory built Air 4 with Gast 1023 rotary vane,10 cfm open flow 8.8 cfm @ 10 psi.115 volt with GFCI. Stainless steel valves and an oversize 290 cfm cooling fan included. 24 x 24 inch mounting pad included.This is a demo unit that was purchased new in 2005 and has never been outside our showroom. Has approx 5 hours on it. Comes with full factory warranty and 4 new Vertex Water Features CoActive airststions. Can power up to 6 diffusers. Aquatic Eco Systems DA-1 post or dock mount aerator. Sweetwater/ Gast AQ 10/FB109 30 psi compressor. Rated 3.3 amps on 115 volt and 1.5 cfm, with upgraded Vertex Coactive Air station. New Components: 140 cfm cooling fan, 8 ft power cord, motor mounts, air filter and exhaust hose, Vertex CoActive Airstation. Cabinet (lockable) has new spruce green paint.The compressor has been completely rebuilt and tested. This system does not come with any weighted tubing add $1.00 per ft for 5/8 inch ID ForeverSink weighted tubing. Warranties are Lifetime on optional ForeverSink tubing, 5 year on Vertex Coactive airstation,1 year on cooling fan and 6 months on Sweetwater compressor. ****** This unit was traded in on a larger system. Lake Life Guard Systems Features: Fine bubble size for high oxygen transfer Versatile system design permits seasonal or continuous operation Minimum maintenance requirements for years of economical performance Oil-less compressors for trouble free operation Self cleaning diffuser prevents fouling or plugging No electrical current in water ensures safe operation For lakes up to 1 acre, Suitable for deep lakes. Quiet operation and very low maintenance. Systems include 1/3 HP, 120 volt rocking piston compressor, power cord, thermal overload protection, one diffuser with check valve and marker float assembly. System available with 100 foot of either non-weighted or weighted airline. For lakes up to 1 acre. maximum depth 18 feet. Systems include 1/4 HP, 120 volt quiet rotary vaine compressor, power cord, thermal overload protection, one diffuser with check valve and marker float assembly. System available with 100 foot of either non-weighted or weighted airline. For lakes up to 5 acres, maximum depth 18 feet. Systems include 3/4 HP quiet rotary vane compressor, power cord, thermal overload protection, pressure relief valve and marker float assemblies. Systems available in 120 or 240 volt with non-weighted or weighted airline and from 2 to 4 diffusers with check valves.Systems include 3/4 HP quiet rotary vane compressor, power cord, thermal overload protection, pressure relief valve and marker float assemblies. Systems available in 120 or 240 volt with 100 feet of non-weighted or weighted airline per diffuser and from 2 to 4 diffusers with check valves. When superior aeration and de-stratification is desired for water bodies that require a more natural setting, permit safe recreational use, require non-moving or non-electrical parts, or are very deep and/or large, AquaAir™ by AquaMaster® is the intelligent choice.Compressors • Manufactured by Gast and Thomas • 1/3 & 1/2 HP 120V & 240V 1 phase (Piston; PN) • 3/4 & 1 HP 120V & 240V 1 phase (Rotary Vane; RV) • Thermal overload motor protection • 2 Year Warranty Compressor Enclosures • Cylindrical stainless steel housing • Chimney effect assists to cool compressor • Heavy-duty cooling fan circulates air around compressor • Stainless steel hasp latch with MASTER LOCK included • Ground mount and post mount (P) available (post mount available in AquaAir 1 and 2 only) • Stainless steel cover and hardware • Ease of internal accessibility • 5 year warranty (cooling fan 2 year warranty) • 5 optional slatted colored covers in: sand green grey cedar blackSuper Sink Air Tubing • Flexible, will not crack or kink even in cold temperatures • Self-weighted for easy installation and quick sinking • 2 sizes available, in 100' coils; 1/2" and 5/8" 1/2": .52" ID x 1.06" OD, 5/8": .63" ID x 1.15" OD • Utilizes PVC insert fittings for quick connections • 5 year warrantyNotes • Sizing guide based on lake turnover rate of 1.5 - 2 times per day. This is adequate to aerate most low oxygen, organic bottom sediment lakes • Narrow lakes or lakes with fingers, coves or other physical features that restrict circulation may require additional diffusers • Lakes with inflow sources of effluent water, highly polluted water, and/or high nutrient drainage run-off water may require additional diffusers. Rotary Vane Pumps Designed and manufactured to meet the demanding requirements of various industrial and scientific applications, Varian’s reliable Rotary Vane Pumps ensure high pumping stability for light gases, low noise, minimal oil backstreaming, and a long operating life. Varian has introduced the first rotary-vane pumps with truly “smart” capabilities, the HS 452 and HS 652. These pumps employ an innovative frequency converter technology that delivers optimal and consistent performance under any combination of input power voltage and frequency, worldwide. Varian’s Rotary Vane Pumps conform with CE requirements, and all pump motors are UL and CSA approved. Features Dual stages Forced oil circulation Anti-suckback valve and vent device Built-in oil shield Gas-ballast valve Forced-air ventilation Motors suitable for all voltages and frequencies DS 42 45.5 liters/min. DS 102 114 liters/min. DS 202 192 liters/min. DS 302 285 liters/min. DS 402 410 liters/min. DS 602 605 liters/min. HS 452 “Smart” Pump 450 liters/min. HS 652 “Smart” Pump 650 liters/min. 1/4 HP HIGH VOLUME ROTARY VANE AERATION KIT This is an excellent pond aeration system for small to medium ponds. The 1/4 HP rotary vane air compressor in this kit pumps much more air than the 1/4 HP rocking piston air compressor. Suitable for ponds from 1 to 2 acres. Operates in up to 18 feet of water. This pond aeraton kit includes high quality Gast 1/4 HP rotary vane compressor, two double-membrane air diffusers with check valves, two valved outlets (to control airflow to each diffuser), 200 ft. tubing, underlays, fittings, and tubing clamps. Optional Weighted Tubing keeps tube on pond bottom and out of sight! Select option above. Draws 5 Amps (115v) and generates 4.2 CFM of air. Ships in three boxes, weighing 46, 42, and 8 lbs. These rotary vane air compressor kits pump considerably more air than the pumps above. Rotary vane pumps do not operate as deep as the diaphragm and piston pumps — maximum operating depth is 18'. A 3/4 HP high pressure model is available which operates to a depth of 27'. The 1/4 HP model pumps 4.2 CFM of air compared to 1.5 CFM with the 1/4 HP piston compressor. This larger volume of air will increase circulation and oxygen levels for faster cleaning of the pond's bottom. The 1/4 HP rotary vane kit is recommended for ponds from 1 to 2 acres, but often is used in ponds less than 1 acre if high fish population, exceptionally poor water conditions or heavy nutrient buildup exists. The 3/4 HP models are recommended for ponds 2 to 4 acres while the 1 HP is used in ponds larger than 3 acres.